HOW Demons are pluging the world into WAR! Strikingly, biblical prophecy says just such a super one-world government is to appear. But do these prophecies imply that our present living generation is the one to live into that time? Even the original first century apostles expected this end of the world as we know it to occur in their lifetime. 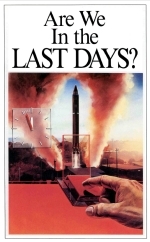 Individuals in every century since have believed the world was at "the time of the end" — that "Armageddon" was near. The modern world really began only about one hundred and fifty years ago. If we have the chronology of human existence about correct, the first human, Adam, was created nearly 6,000 years ago. The Bible shows that God's Master Plan for working out his purpose here below is a 7,000-year plan with some 6,000 years allotted to this world of Satan, followed by 1,000 years of Christ's reign over all nations of the earth. Somewhere around 1,600 years from Adam's creation came the earth wide Flood. How civilization developed prior to the Flood we do not fully know. But we may assume the material civilization progressed no farther than in a similar span after the Flood. So far as we know, therefore, the development of human civilization continued on a comparatively even keel until about 150 years ago. Knowledge has been increased at a breathtaking rate in the last 150 years. Indeed, it was claimed that the world's fund of knowledge had doubled during the 1960's — although this increase was largely in the areas of medicine, science and technology. Also, people are traveling "to and fro" on the earth. The mode of travel from the beginning of civilization until 150 years ago was indeed very slow. Few people traveled more than 50 or 100 miles away from their homes. Travel for millennia was by foot, horseback, camel back, oxcart, rowboat or sailboat. In the second chapter of Daniel is a prophecy reaching till the Second Coming of Christ. King Nebuchadnezzar had framed and ruled the first empire of nations in world history. He saw in a dream a most astonishing statue of a man incredibly high. God revealed the meaning to Daniel. The image's head was of fine gold, breast and arms of silver, belly and thighs of brass. Legs of iron, and feet and toes of iron and clay mixed. The head represented Nebuchadnezzar's Chaldean Empire. The silver represented the succeeding world kingdom, which proved to be the Persian Empire. The brass represented a third world kingdom, which proved to be the Greco Macedonian or Grecian Empire; the forth, represented by the legs of iron, proved to be the Roman Empire with capitals in Constantinople and Rome. The feet and toes represented succeeding smaller empires to follow, leading to the toes representing ten kingdoms in Eastern and Western Europe. The prophecy dates the time in which we are living now. We await the appearance of those ten-toe nations. In the days of those toes, now just ahead of us, a stone supernaturally is to come from heaven, smite the ten-toe nations, replace them, and rule the whole earth forever after (Dan. 2:34, 44). This stone represents Christ's Second Coming to set up the kingdom of God and destroy all this world's governments — setting up the government of God over all nations. That will be the end of this world — the end of this man-made civilization as we know it. We are now looking for the tenth and last resurrection of the Roman Empire — the seventh head of this Beast of the 17th chapter of Revelation (Rev. 17:12), which is also pictured by the ten toes of Nebuchadnezzar's image of Daniel 2:40-44. Since these toes were on the two feet that represented Eastern and Western Europe, there is strong likelihood that this final resurrection of the Holy Roman Empire will include Iron Curtain nations of Eastern Europe as well as nations in Western Europe. (Read our two booklets "The Book of Revelation Unveiled at Last" or "Who or What Is the PROPHETIC BEAST?") They will form a third gigantic world power probably as great or even greater than the U.S.S.R. or United States of America. These were actually the ministers of Satan the devil, but came in Jesus' name, saying that Jesus was the Christ. However, they misrepresented Jesus, so that in fact they were preaching about "another Jesus" — a different Jesus (verse 4). Jesus came as a messenger from God bearing a message about the coming kingdom of God to take over and rule all nations. That was Jesus' gospel. Notice the gospel which Jesus proclaimed. In Mark 1:1, it begins to relate the beginning of the gospel of Jesus Christ. It mentions how John the Baptist prepared the way, and how Jesus was baptized by John. Then in verse 14, "Now after that John was put in prison, Jesus came into Galilee preaching the gospel of the kingdom of God" what gospel did Jesus preach? — "the gospel of the kingdom of God." That is the gospel of Jesus Christ. That is the gospel proclaimed by the apostle Paul to gentiles (Acts 20:25, 28:23, 31). Mark this well. That gospel was not proclaimed to the world for 1,900 years. In the very first century, they turned to a different gospel — a gospel about Christ, but not the gospel OF Christ. Read that again. To this very day, nearly all churches and evangelists preach their own gospel ABOUT Christ, but not the gospel OF Christ about the coming kingdom of God to rule the world. For 1,900 years traditional Christianity has failed to preach about. Jesus as coming KING and world ruler in the coming kingdom of God to replace Satan on the throne of the whole earth. A FALSE GOSPEL has been universally proclaimed. Now with all this in mind, return to Jesus' prophecy in Matthew 24. He was warning his own disciples about false prophets coming in his name saying he, Jesus was the Christ, and deceiving the MANY — not the few, but the MANY. That started in the very first century soon after the church was founded and has continued to this very day. It is true almost universally in a professed Christianity to this minute. All governments are based on foundational laws. The foundational law of the government of God over the whole world will be the law of God. That law may be expressed in the one word "LOVE." Jesus magnified that law to mean love toward God and love toward neighbor. This, in turn, was magnified by the Ten Commandments — the first four giving four broad principles defining love toward God, the last six commandments defining in broad principles love toward neighbors. Now once again back to the 12th chapter of Daniel. Just after he spoke of the time of the end (Daniel 11:40), Daniel speaks also of the same great tribulation — a time of trouble greater than ever before or ever to come." And at that time shall Michael [a great archangel standing against Satan] stand up, the great prince which standeth for the children of thy people: and there shall be a time of trouble, such as never was since there was a nation even to that same time: and at that time thy people shall be delivered, every one that shall be found written in the book. And many of them that sleep in the dust of the earth shall awake, some to everlasting life ..." (Daniel 12:1, 2). Meeting Christ in the Air — Where Then?